The Stayco range of pull-out staircase steps takes the traditional non ground contact vehicle ladder step to a new level of safety, quality and ease of operation. The steps incorporate full damping to the lowering movement of the staircase. 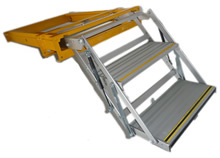 Unlike many pull out staircase steps, the staircase is held in the deployed position by the action of a pair of sliding links on the staircase rather than the conventional support brackets mounted to the end of the step casing. This system gives a very solid feel to the step compared to the springy bouncing movement of other makes. The 550mm wide by 250mm deep treads provide safe, non-slip two point contact to each foot. The slide casing is made from powder coated mild steel with the treads and links in anodised aluminium alloy. All pivot points have nylon bushes and stainless steel bolts. The tread unit runs on nylon rollers in the step casing. It is retained in the closed position with a simple spring-activated latch working with rubber end-travel stops. The lower tread incorporates a striking tiger stripe anti- slip rubber in addition to the anti-slip profile of the surface of the tread units. The front of the lower tread also incorporates a soft rubber nosing strip. It can be fitted with a limit switch to activate a warning in the vehicle to indicate when the step is deployed.